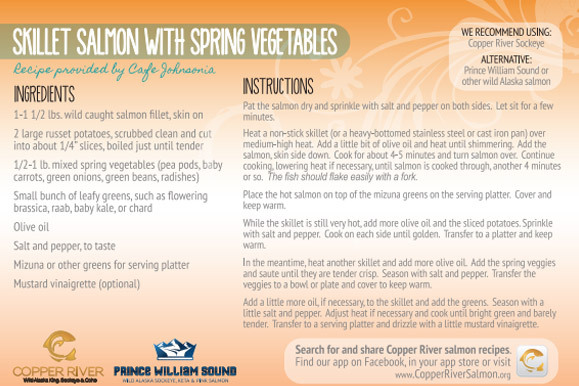 It's easy to cook salmon! Follow these steps for a delicious healthy meal in minutes. 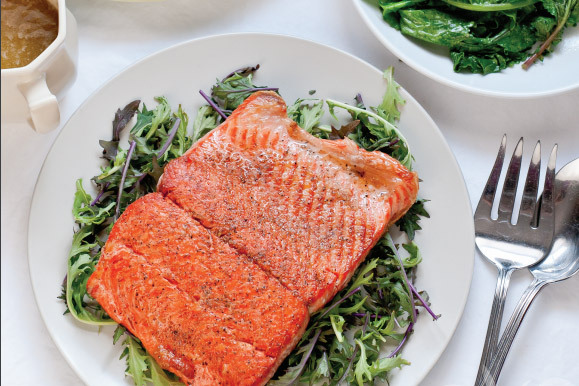 The rich flavors of Copper River king, sockeye and coho salmon pairs beautifully with dry red and white wines that have fruity notes such as Pinot Noir and Cabernet Sauvignon. Choose hoppy beers like IPA's and Pilsners as an alternative to wine. There are several ways to enjoy Copper River Salmon Blueberry Gravlax. Always serve sliced thin and on the diagonal. The dark sweet blueberry outside, pared with the slightly salty inside go well in any traditional recipe that uses Gravlax. Gravlax, properly refrigerated, will last two weeks. 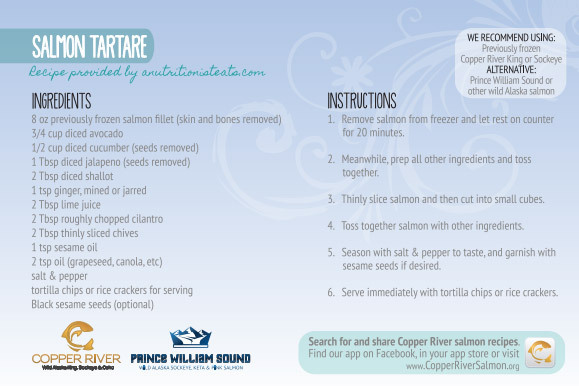 1 Fillet Copper River Red Salmon, skin & pin bones removed • 3/4 Cup Sea Salt or plain Kosher non-iodized salt. In a food processor fitted with a blade, process the curing mix with a few pulses. Using a 9x13 pan lay in a generous amount of heavy duty 18" wide foil. Pour in 1/2 the curing mixture. Lay the skinless, boneless Copper River Red Salmon on top of the cure making sure the bottom of the fillet is covered with cure. Top with the remaining cure. Spread the cure all over the fish making sure to cover all the flesh. Fold up the sides of the foil to cradle the fish, & again make sure the fish is completely covered with cure. Cover the top of the fish with Saran Wrap and weight it down with a couple foil covered bricks (or anything you can find to weight down the fish). Place the pan in the refrigerator for 24- 36 hours, turning the fish every 8-12 hours. When the fish is cured it will be stiff. Remove from pan and wipe off any cure & give it a light rinse with a bit ice cold water. Slice the Gravlax on the diagonal in thin slices and enjoy! If mixture seems too loose add more breadcrumbs. Refrigerate for an hour or longer. This will help the mixture to firm up and hold together better. Form into 2-3 inch patties and roll in extra breadcrumbs. Heat avocado oil in pan over medium heat. Pan fry 3-4 minutes per side, turning only once. Serve with Sweet Chili Sauce for dipping and enjoy! In a large mixing bowl, combine soy sauce, sesame oil, grated ginger and chopped garlic. Add in the cubed Copper River salmon to the liquid ingredients and stir to coat the salmon thoroughly. Add the chopped green onion, cubed avocado and diced pepper. Combine all ingredients well. Mixing with hands is the best technique to prevent salmon from being becoming mashed. 2 Cups Jasmine Rice Prepared as directed, keep warm. Add 1 can of the coconut milk, bring to a simmer and reduce to medium-high heat. Continue stirring well. Consistency will be thicken after about 15 minutes. Melt butter on low heat in a medium sauce pan. Add the capers and the juice from the end pieces of the lemons into the melted butter. Trim the ends of the asparagus. Dress the asparagus with a bit of olive oil. Place the salmon fillet onto the sheet pan lined with parchment paper (this is optional) and sprinkle with chives. Arrange the asparagus on the pan around the fillet. Pour the butter mixture onto the fillet evenly. Top the fillet with lemon slices. Season with salt and pepper generously. Roast in the oven at 350F for 12-16 minutes or until the internal temperature at the thickest part reaches 120F. Serve immediately with optional garnish of chive blossoms. A pan-Asian inspired dish with light, zesty flavors that can be plated in a variety of creative ways. Sliced pancakes can be dipped in mixed ingredients like an appetizer or pile the ingredients to present a symmetrical entrée. Heat about 2 tablespoons vegetable oil in a skillet on medium high heat. Spoon out batter into skillet and smooth into round shape to create cakes about 5”-6” wide. Combine ¾ cup brown sugar and 3 tablespoons soy sauce in a bowl and thoroughly mix until brown sugar is dissolved. Mix in ¼ tsp black pepper and salt to taste. To assemble, place scallion pancake either whole or quartered onto a plate. Add about three dollops of lime cream sauce and a serving of salmon to the plate. Garnish with fresh scallion and sesame seeds and serve! In a soup pot cook the bacon over medium heat, stirring, until crisp. Transfer to a paper towel lined plate and reserve until chowder is finished. Pour off any pancetta/bacon fat that's in the pan and saute the onion, carrot, garlic and celery in butter over moderately low heat, stirring occasionally, until softened. Sprinkle flour over mixture and cook, stirring, 3 minutes. Stir in paprika and ginger and cook, stirring, for about 1 minute. Add the ale, vegetable broth, water and cream and bring to a boil. While mixture is coming to a boil, husk the corn and slice off the kernels. Add diced potato and corn kernels to the chowder and simmer uncovered for about 12-15 minutes. Stir in salmon and continue to simmer until the fish is just cooked through, about 5 minutes. Stir in chives, reserved bacon, and add salt and pepper to taste. Serve chowder with herbed oyster crackers. Pat the salmon dry and sprinkle with salt and pepper on both sides. Let sit for a few minutes. Heat a non-stick skillet (or a heavy-bottomed stainless steel or cast iron pan) over medium-high heat. Add a little bit of olive oil and heat until shimmering. Add the salmon, skin side down. Cook for about 4-5 minutes and turn salmon over. Continue cooking. lowering heat if necessary, until salmon is cooked through.another 4 minutes or so. The fish should flake easily with a fork. Place the hot salmon on top of the mizuna greens on the serving platter. Cover and keep warm. While the skillet is still very hot, add more olive oil and the sliced potatoes. Sprinkle with salt and pepper. Cook on each side until golden. Transfer to a platter and keep warm. In the meantime, heat another skillet and add more olive oil. Add the spring veggies and saute until they are tender crisp. Season with salt and pepper. Transfer the veggies to a bowl or plate and cover to keep warm. Add a little more oil, if necessary, to the skillet and add the greens. Season with a little salt and pepper. Adjust heat if necessary and cook until bright green and barely tender. Transfer to a serving platter and drizzle with a little mustard vinaigrette. Remove salmon from freezer and let rest on counter for 20 minutes. Meanwhile, prep all other ingredients and toss together. Thinly slice salmon and then cut into small cubes. Toss together salmon with other ingredients. Season with salt & pepper to taste, and garnish with sesame seeds if desired. 6. 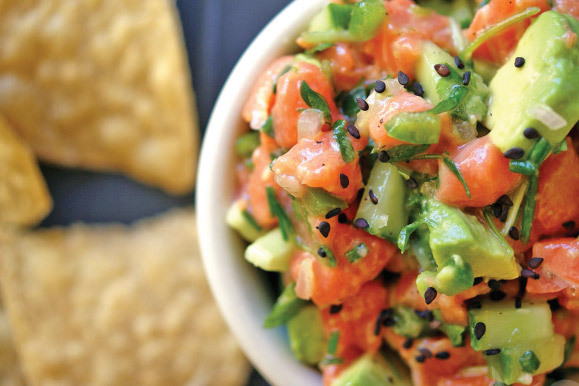 Serve immediately with tortilla chips or rice crackers. Heat grill over medium heat Lay aluminum foil over the grill and spray with non-stick cooking spray. When grill is hot, lay salmon fillets over the foil and sprinkle with salmon rub seasoning. Cover and allow to grill until cooked through. Check to ensure they are not over done. About 7-8 minutes on medium heat. Distribute shredded cabbage, carrots, and cilantro into the soft tacos shells. Set aside. In small bowl whisk together mayo, green sauce (or salsa verde), and Tabasco sauce. Set aside. Once salmon is done, remove from grill and allow to rest for 5 minutes, tented with foil. Place salmon into tortillas with vegetables. Drizzle green sauce aioli over the top. Devour warm. Lay your pita on a cookie sheet. In a small saute pan heat olive oil to med/high heat. Saute onions and garlic just a minute or so until they are just starting to become tender. Spread marinara on the pita leaving 1" from the edge. Sprinklel/2 of the mozzarella on the sauce. Sprinkle the sauteed onions and garlic on the pizza. Sprinkle the oregano and capers on. Break the smoked salmon into big chunks and flakes and put it, along with the bacon crumbles on the pizza. Cover with the remaining half of the mozzarella. Bake at 425 in the center of the oven for 7-10 mins. Remove from oven and sprinkle with a touch of parmesan cheese and fresh crushed ground black pepper. Slice with a huge knife and serve! Combine all ingredients for the pineapple salsa leaving the two whole bell peppers aside for later use. While salsa is in fridge begin the salmon preparation. Cut the skinned salmon fillet into roughly 2” cubes. Mix all spices for the blackening rub and coat salmon cubes in the spice mixture. Heat 2 tablespoons butter in a small skillet over high heat until browned. When butter browns add seasoned salmon cubes and sear on both sides until crispy and brown. To assemble salsa boats place bell pepper pieces on a serving tray. Top each pepper slice with a salmon cube. Spoon pineapple salsa over the salmon. Garnish with cilantro and leave extra salsa for the side. Lay salmon skin side down on a baking pan (lined with parchment) and drizzle with olive oil to your liking. Season salmon with sea salt and black pepper to your liking. Sprinkle capers over the salmon. Lay half of the lemon slices evenly around the baking pan. Top the salmon with the chopped chives. Bake on center rack for 12-15 minutes or until barely cooked through in the center. Remove from oven and serve with remaining lemon slices and chives blossoms as garnish. 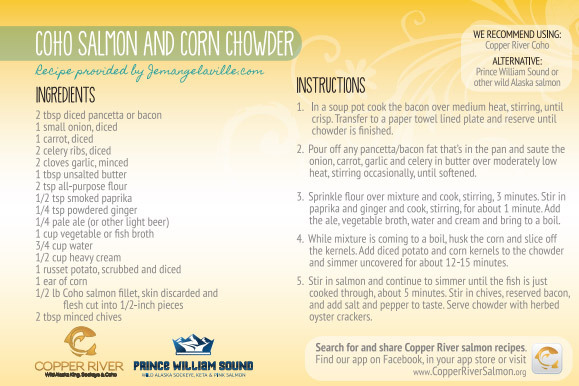 Chef's notes - This recipe pairs well with Erath Winery Pinot Gris. This fruit forward wine brings notes of honey, pear, and pineapple to the meal. Soak the cedar plank(s) in water for at least one hour before use. Coat each side of the salmon steaks with olive oil and arrange on the soaked cedar plank. Place sprigs of fresh rosemary underneath and in between the salmon steaks. In a small bowl mix all the spices together and sprinkle the mixture evenly across the salmon steaks. Place the cedar plank on grill or campfire grate over coals for cooking. Avoid cooking over open flames. When fish is opaque all the way through or has reached an internal temperature of 140º F remove from heat and serve. 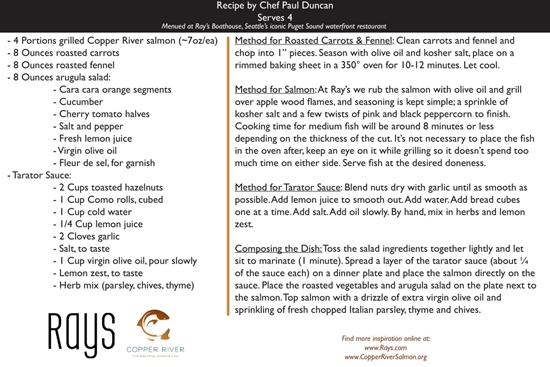 Chef's notes - This recipe pairs well with Erath Winery Pinot Noir. The vanilla and dark cherry notes of this wine pair well with the smokiness of the cedar plank and rosemary. To assemble, gather all ingredients and place a 3”-4” wide cookie cutter on serving plate. Divide the salmon evenly into 4-6 portions and press half of each individual portion evenly into the mold of the cutter. Subsequently layer pear, cucumber and avocado, pressing down evenly after each layer. Finally, add the other half of the individual salmon portion and carefully remove mold. 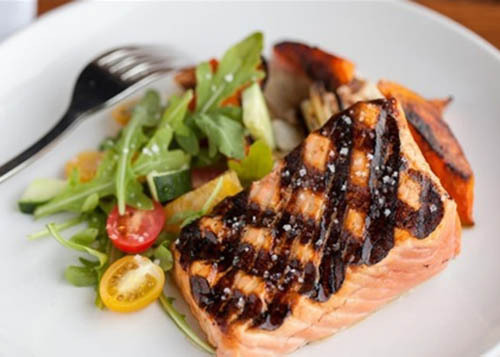 Garnish each salmon stack with remaining green onions and drizzle with Halm’s Hawaiian BBQ sauce. Additional garnishing ideas include sesame seeds, jalapeños, salt and olive oil drizzle. Let Copper River salmon be the star of the show with a supporting cast of juicy, bright citrus and crisp colorful radishes, including watermelon, French breakfast, or Daikon. Sautéeing the radishes in golden brown butter coaxes out some of their natural sweetness and the fresh herb sauce brings it all together. Any leftover salmon can be tossed with the herb sauce and yogurt for a light and satisfying salmon salad. Make the herb sauce by combining herb bundles, garlic, jalapeño, cumin, coriander, 1/2 tsp salt, and white wine in a food processor. Drizzle in oil until the sauce comes together. Taste and add more salt, garlic, or chili as needed. Prepare the citruses by peeling and removing the pith of each fruit. Cut into segments and set aside. In a large skillet over medium-high heat, melt 2 Tbs unsalted butter. Add radishes and season lightly with salt. Cook, stirring occasionally, about 7 minutes until radishes are just tender and browned. Remove radishes from pan to serving dish. Return skillet to medium-high heat. Pat salmon portions dry with paper towel and season both sides lightly with salt and pepper. Heat 1 1/2 Tbs oil in the pan and cook salmon fillets, skin-side down, for 3 minutes. Gently turn fillets over and scatter cooked radishes around the fillets in the pan and let cook, another 2 to 3 minutes. Toss radishes and citrus segments together; serve with salmon and herb sauce. with olive oil and kosher salt, place on a rimmed baking sheet in a 350-degree oven for 10-12 minutes. 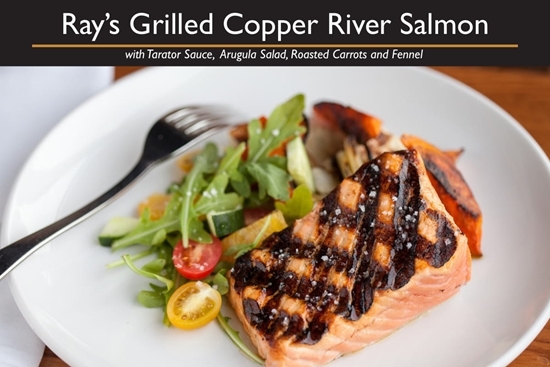 At Ray’s we rub the salmon with olive oil and grill over apple wood flames, and seasoning is kept simple; a sprinkle of kosher salt and a few twists of pink and black peppercorn to finish. Cooking time for medium fish will be around 8 minutes or less depending on the thickness of the cut. It’s not necessary to place the fish in the oven after, keep an eye on it while grilling so it doesn’t spend too much time on either side. Serve fish at the desired temperature of doneness. Blend nuts dry with garlic until as smooth as possible. Add lemon juice to smooth out. Add bread cubes one at a time. By hand, mix in herbs and lemon zest. Toss the salad ingredients together lightly and let sit to marinate (1 minute). Spread a layer of the tarator sauce (about ¼ of the sauce each) on a dinner plate and place the salmon directly on the sauce. Place the roasted vegetables and arugula salad on the plate next to the salmon. Top salmon with a drizzle of extra virgin olive oil and sprinkling of fresh chopped Italian parsley, thyme and chives.